There are some Sundays when nothing else will do, and then we make the walk down Stargarderstraße and Schliemannstraße and Rykestraße until we arrive at Albrechts Pâtisserie's cheery red awning. Through the plate-glass windows I try to identify the tarts on offer: a meringue dome elicits a special beat of excitement. 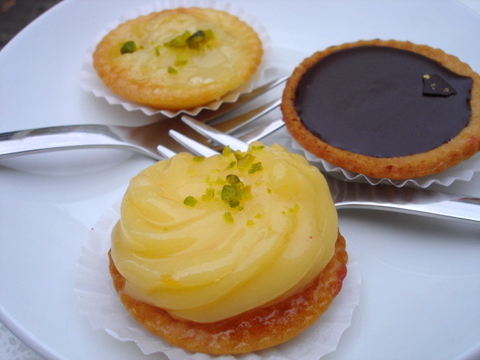 In an email, a French reader of Berlin Reified sniffed at the jewel-like display of the tarte au citron, the millefeuille and the chocolate globes, preferring, I suppose, the luxurious plentitude of Paris pastry shops; still, the neatness keeps things übersichtlich. And note that alongside the classic French sweets one finds a generous selection of Stephanie Albrecht's own creations, such as rhubarb or blackcurrants crowned with crisp meringue. Indecisive types might opt, as I often do for the gemischte Petits fours: three tiny tarts of your choosing, to be consumed in four careful bites. The tangy rich lemon curd made the Zitronen-Tarte my favourite (and the sprinkling of pistachio nuts lent the tart a pleasing bite). Now that the weather's turned colder, the glossy white sidewalk tables are gone and one needs to cram into the small shop itself. Be warned that 1) there's no toilet and 2) there's a bit of a Ralph Lauren photo shoot vibe at the weekend (so many children in neat coats of navy or forest green, so many noble fathers with trim gray flannel trousers and manes of dark blonde hair). But they can also pack your treats into cunning paper boxes to tote away; or, for those in that corner of Berlin, the Albrecht's in Winterfeldstraße has neither of these issues and the same lavish selection. For me, the cramming is a small price to pay for a beloved Sunday ritual. For the sake of accuracy, I would like to clarify that "we make the walk down Stargarderstraße and Schliemannstraße and Rykestraße" should really read "Berlin Reified scuttles along Stargarderstraße and Schliemannstraße and Rykestraße, while faithful David, ignorant of our final destination but trusting, brings up the rear."